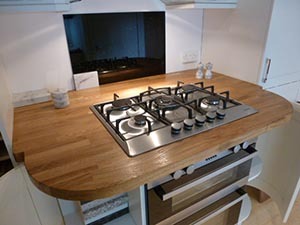 We source kitchen worktops direct from manufacturers all over Europe. Your kitchen worktop is probably the most important component in your kitchen - it should be durable, heat resistant and hygienic, but should also complement the overall design, matching or contrasting the kitchen cupboard doors, cooker and sinks. 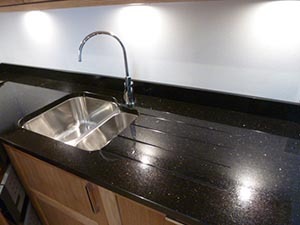 We can provide kitchen worktops in a wide variety of materials, offering functionality and versatility to suit all needs, including natural stones, woods, metals, crafted glass as well as laminate kitchen worktops. Where possible or worktops are made from renewable and sustainable sources. 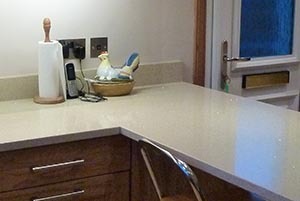 When you have selected the material for your kitchen worktop we will produce a CAD design, minimising the number of joints and showing how your kitchen will look when completed. 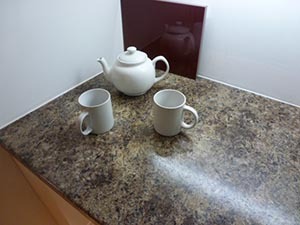 We have a wide range of stone, laminate a real wood worktop samples available at our showroom.